Swansea City have a plan in place should Michael Laudrup leave the club, chairman Huw Jenkins has admitted. Manager Laudrup still has 16 months to run on his contract, but has been linked with Real Madrid in the wake of his success at Swansea. Jenkins has opened talks with the Dane about an extension, but says the club are prepared for any eventuality. "We wouldn't be doing our jobs if we didn't have some idea of who... will suit Swansea City," he said. Jenkins told BBC Radio Wales' Back Page programme: "Our job is always to be on the lookout for players and watch other teams playing, and in that context different managers as well. "So you're always aware of what's going on around Britain and Europe." Swansea have already won the Capital One Cup and are eighth in the Premier League having reached the manager's pre-season target of 40 points. 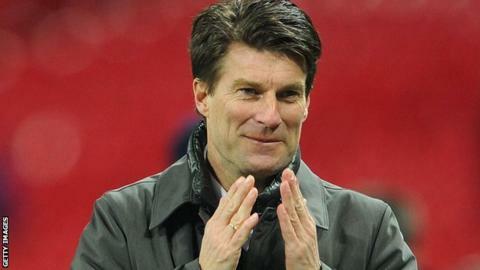 His success has led to Laudrup's name being linked with managerial jobs in Europe. And he recently topped a poll of Real fans asked who should replace Jose Mourinho as manager. Jenkins appears unconcerned: "The first thing is, he intends to be here next season," he said. "We will be having talks over the next few weeks about a possible extension." Jenkins has had to deal with the departure of three high-profile managers in his time at Swansea. He recruited Paulo Sousa to replace Roberto Martinez; Brendan Rodgers to replace Sousa and Laudrup when Rodgers moved to Liverpool last summer. And Jenkins revealed the club's financial approach and playing style helps him filter potential candidates. "I think the fact that we run our club a certain way makes it easier to narrow down the hundreds of players and managers. "And it's not easy to find the right person with the right personality to suit the club at that time. "Because whatever happens to Michael Laudrup, whether it's two years time or five years time when he leaves our club, it's going to be a big position to fill and we need to be ready for that."